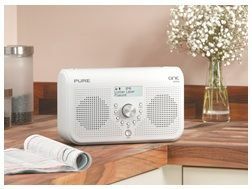 Pure has unveiled its latest time shifting DAB radio, the Pure One Elite Series 2. The radio offers Listen Later, a function that allows you to record a radio broadcast to listen to, er, later - in the same way as the Pure Classic Series 2 before it. As well as saving a radio show for later, you can pause and rewind live radio - perfect for when you miss the name of that catchy new song you love. It also gives you a little more control than the Classic - you can tweak the bass and treble settings and it features an FM radio tuner alongside its DAB capabilities. Other handy additions include radio alarm, kitchen timer, 30 station presets, Intellitext and an MP3 input jack. Perfect for the kitchen, the Pure One Elite Series 2 comes in smart black or white finish, and comes with a UK price tag of £85.